For those of us going to this year’s General Assembly conference, the UUA has compiled a fabulous list of tools to help us prepare. It includes readings, videos, books and activities. Below are six videos featured in their list of preparatory tools. I’m using them to jump start my preparation. I invite you to do the same. Videos vary from the full length documentary 13th to a 3 minute clip of comedian Aamer Rahman. Have a team going to General Assembly? Check in on your preparatory education and reflection plans. Besides making sure everyone knows about these tools to prepare for GA, you might want to plan an opportunity to watch one or more of these videos as a group. August 29, 2015 marks the tenth year since Hurricane Katrina became a platform for a conservative recovery agenda pushed by then President George W. Bush. This agenda spearheaded the privatization of public places and public services in New Orleans and the storm-damaged communities of the Gulf Coast Region. The inequities and unjust outcomes of this agenda are laid bare in the short film Ten Years after Katrina: “Recovery,” “Resilience” & REALITY produced by the Greater New Orleans Organizers Roundtable. Rev. William Barber, II, leader of Moral Mondays, Forward Together and NAACP NC, speaks on his new book The Third Reconstruction: Moral Mondays, Fusion Politics, and the Rise of a New Justice Movement (Beacon Press). He calls for a nation-wide moral revival and offers a blueprint for state-wide grassroots organizing. In this thought-provoking documentary, scholars, activists and politicians analyze the criminalization of African Americans and the U.S. prison boom. Jay Smooth is host of New York’s longest running hip-hop radio show, the Underground Railroad on WBAI 99.5 FM in NY, and is an acclaimed commentator on politics and culture. Nashville’s most famous chicken dish began as an act of vengeance by a spurned girlfriend of entrepreneur Thornton Prince in the 1930s. Instead of feeling burned, Prince was inspired and turned Hot Chicken into a thriving business. Prince’s Hot Chicken Shack is still in business but never grew outside of Nashville–even though his recipe is making money for others all over the world. At SOCAP16, Devita Davison of FoodLab Detroit told the full story of Hot Chicken, to illustrate cultural appropriation in action and the barriers to success that minority entrepreneurs often face. Is this your first General Assembly? If so, this collaborative unofficial UUA General Assembly Survival Guide is for you! This collaborative post and “survival guide” features tips and reminders for attending the annual General Assembly conference of the Unitarian Universalist Association! Note this edition has information specific to the UUA’s June 21-25, 2017 General Assembly in New Orleans, Louisiana. This post was first made by a UU Growth Lab brainstorm in 2011 with my updating annually. Have a tip or resource to add? Share it in a comment at the end of this post. Share your tips, share this post with fellow UU’s attending for the first time, and I’ll see you at GA! The staff of the UU World does an amazing job covering General Assembly. Their GA blog and social media channels are the go to source for in-depth and breaking General Assembly news. To get the most out of this General Assembly, schedule time to dive into these recommended tools to prepare for GA. These include readings, videos, books and activities. Don’t wait until the week before. You’ll want to pace yourself to make the most of these resources. I’m jump starting my preparation by watching the 6 videos featured in this list. GA prep movie night? Note there are these additional opportunities, but they require advance registration. Plan your life at General Assembly assuming you will not be able to access wi-fi in the convention center. Internet access is always and issue. Bring critical information and contact numbers with you. If access is good, enjoy! But be prepared. Order a Standing on the Side of Love yellow shirt if you want to join fellow UUs wearing them while participating in the 2017 GA service projects (advance registration required) and at the #LoveResists Rejoicing for Sanctuary & Solidarity public witness on Friday, June 23, 2017 at 5:00 to 7:00 p.m.
Convention centers, especially the main halls, are usually freezing! Bring a layer you can easily take on and off so you’re okay going from outside to hallways to the general session/plenary ice box. Hydrate! Bring a water bottle. If you’re flying, bring an empty one to fill at a water fountain after you go through security. You can usually buy a reusable bottle in the Exhibit Hall. If you are a delegate, READ related business materials before you come. You are deciding our future. Everything delegates need to review is available here. GA is amazing for network and learning. Bring business or personal cards so that you can give your information to others. Be sure that someone from your congregation is bringing the banner for the banner parade. Download & review the Program Guide ahead of time. The UUA GA Mobile App is fantastic. If you have a smartphone, make sure to install it. It will significantly improve your GA experience. Plan on exploring and testing the app before you arrive. There are a lot of features. You can choose to follow posts by other attendees, share your own posts tagging which event you’re at, and much more. The week leading up to GA, try opening the app each day. People will already be posting. Plan out what workshops you want to go to. Have a tentative choice made for all time slots in advance. You’ll need time between schedule blocks to take care of biological needs, talk to people, and change rooms. You won’t have time to pick as you go. Pick a 2nd workshop for each time slot. You may find that when you arrive at your first choice it’s not what you expected and it will be good to know exactly where to go to get to your 2nd choice. Bring a bag you can carry comfortably with you at all times, like a shoulder bag or light backpack. If you’re asked to carry your congregations banner during the banner parade, figure out how the poles/carrying PVC pipes go together before hand. Here are banner specs from the UUA (pdf). Talk to people in your congregation to find out about resources you can scout out and bring home and questions they might have, especially if your congregation has a very limited budget and will be under-represented by delegates. It is even nicer when you reach out to area congregations if your cluster is composed of smaller, less financially able congregations, and see how you can help. If you can’t walk more than a mile easily, you will want to rent a scooter through GA Accessibility Services. If you often use hearing assistive devices in crowded settings, you will want to use GA Accessibility Services. Better to reserve equipment you turn out not to need than arrive & be blocked from participating because no extra equipment is available. If you have special dietary requirements, scout out the food vendors before departure and plan well ahead. Make reservations at places that will accept them. Pack extra food if you have really specific needs. It isn’t uncommon to have to wait at GA area restaurants for a long time, or to have relatively few places that can accommodate vegans, folk who need to eat gluten-free, or even offer acceptable fast alternatives for diabetics. If you are the only one you know going to GA, start making connecting with people via the GA app and on Twitter. For example, on Twitter you might tweet “Looking forward to _____ at this year’s #UUAGA conference.” Fill in the blank with what you’re excited about. 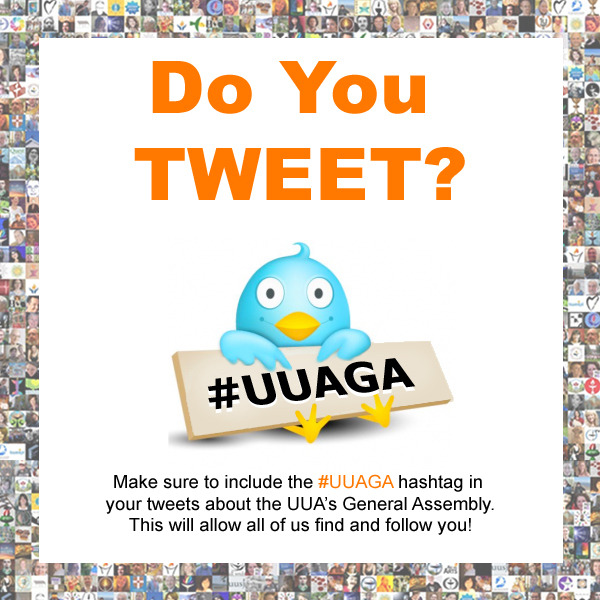 By including the #UUAGA hashtag we can find your tweet on Twitter. On the GA App you can share posts with photos. You might share a photo of yourself and share what you’re looking forward to and what leadership role(s) you have in your congregation. If you really want to hang out with your former minister that you haven’t seen in ten years, email them now and ask them to breakfast. They will either say “yes” or “I’d love to talk to you for a minute at some point, but my schedule is totally booked.” If you wait until GA to ask, the answer will almost certainly be the second one. Ministers are really busy during GA. I’ve found that breakfast is the meal they are most likely to be free. Prepare your elevator speech about what Unitarian Universalism is and why you are one. Local folks ask questions; be prepared to answer. Now that you’ve arrived, remember to HYDRATE! And take time to eat and pace yourself. GA is a marathon. You don’t have to go to everything. And that’s ok. I ended up skipping things last year, including the Ware Lecture, because I needed a breather. And dinner. Besides it will be online. You need to eat. You’ll need to schedule that in. Attend the orientations, from GA for First Timers to your regional/district ones. They help. Say “Hi” to people & don’t be shy to tell them that you’re a first timer. A great way to meet people is to introduce yourself to people when you sit down in a workshop. You already know you have a common interest. Say hello and strike up conversation. Whatever you do, go to the Service of the Living Tradition & the Sunday morning service. See program highlights. Having a meal with other UUs from across the country can sometimes be more valuable than going to a workshop. I was told this by my congregation and it really made a difference for me. During a general session (previously called plenary) , if you aren’t sure what you’re about to vote on, don’t hesitate to ask for a point of clarification from the procedure microphone. Because if you don’t know what you’re voting on, at least 100 other people there don’t know either. There’s this GA tradition that I don’t fully get – getting as many possible ribbons from booths to hang from the bottom of your nametags. When you check in, at least last year, you even got some “coupons” to take to certain booths to get certain ribbons. I just followed the crowd on that one. GA volunteers are often wearing specific shirts or pinnies that identify them easily. They’re there to help you. GA is really possible because of the kindness and support our volunteers give. If you are in need of emotional or spiritual assistance, if you experience any kind of harassment, talk to any shirted GA volunteer and ask them to help you be connected with either the Right Relations Team or the chaplains. You are an ambassador of Unitarian Universalism! Many people in and around the convention center will be meeting their first Unitarian Universalists. While at General Assembly, bring your best self and make living our values an intentional practice. Sore feet because you forgot your comfy shoes is not an excuse. Be kind. Be generous. Smile. Pick up trash. You are not a tourist. You are not a business conventioneer. You are an ambassador of our faith. If you love to sing, GA Choir is your cup of tea. Rarely do we belong to congregations that can boast so many great voices or musicians. Pre-registration for the 2017 Choir is required. Onsite choir sign-up only occurs if space is available. GA is a great time to get on Twitter. You’ll be surrounded by people to give you advice and amazing content to tweet about. The following video was made before the 2014 GA in Providence. The process and tips all still apply, just know that the GA specific examples are now from that past GA. It will get you up and running in 20 minutes. Just make sure you go to GA in the right city – New Orleans! Going to film video at GA with your smartphone? Checkout my video tips page. Whether you are tweeting or sharing on Facebook or another platform, GA can be a great place to record videos. If you are at GA with a team, you might take turns filming video updates from GA. The UUA’s tools to prep for GA page includes information on historical and other tours. UPDATE: You may access resources and recordings here. I’m excited to announce that the four-part #UUsGetSocial workshop series at the UUA’s General Assembly conference is going to be video taped. It will not be live streamed. If you’re going to General Assembly, I hope you’ll join us. You may find the full program book online here. If you’re going to be at GA and have a smart phone or tablet, make sure to get the official UUA GA event app. I’ll be at General Assembly all week, including during ministry days, so make sure to connect. Besides helping to lead this series, I’m going to be talking with clergy colleagues about a new series of social media learning opportunities specifically for parish ministers on making your public ministry more public. Yes, if you are a professional minister being paid to do public ministry, I think it is critical that you have a strong online identity — YOU, not just your congregation. Oh yes, I’m talking about using clergy personal branding as a catalyst for Unitarian Universalist growth. Look for our Leading Congregations ad in the program book. It shares contact information for contacting me and Amy at General Assembly, plus an invitation to subscribe to our newsletter. I’ll be sharing new social media educational offerings and resources via the newsletter following GA. Don’t miss out! Some offerings are going to have limited participation, and I’m going to share invitations with subscribers of our newsletter first. Hope to see you at GA! The following list of tips for attending your first General Assembly conference of the Unitarian Universalist Association was made collaboratively by the UU Growth Lab. It was first published in 2011 and has since been updated annually. The UUA’s 2014 General Assembly takes place this June in Providence, RI. Plan your GA life assuming you will not be able to access wi-fi in the convention center. Internet access is always and issue. Bring critical information and contact numbers with you. If access is good, enjoy! Otherwise, be prepared. Order a Standing on the Side of Love yellow shirt if you want to join the crowds who will wear these shirts during our Public Witness event on Saturday night. Order via UUA Bookstore here. Hydrate! Bring a water bottle. If you’re flying, bring an empty one to fill at a water fountain after you go through security. You can also buy a reusable bottle in the Exhibit Hall. If you’re representing your congregation and they have a budget, you might be able to get some good discounts on curricula, books, and marketing materials (banners, postcards, etc.) but remember you’ll have to have a way to get them back. If you are a delegate, READ the stuff before you come. You are deciding our future. Available here. Bring business or personal cards so that you can give your information to others. Be sure that someone from your congregation is bringing the banner. Plan out what workshops you want to go to, but don’t be wedded to the idea. Pick a few you certainly want to go to, but be open because you’ll change your mind at least once while there. Bring a bag you can carry comfortably for days, like a backpack. Last year I had a binder where on the back cover I had a map of the area in the plastic cover thing, the front with my delegate card and other really important info, and inside my travel info, the program book, the business resolutions, etc. It really helped me stay organized throughout. Put in paper to take notes on, bring pens, etc. I had that with me in my laptop bag and it was great. If you can’t walk more than a mile easily, you will want to rent a scooter through GA Accessibility Services. If you often use hearing assistive devices in crowded settings, you will want to use GA Accessibility Services. Better to reserve equipment you turn out not to need than arrive & be blocked from participating because no extra equipment is available. GA Accessibility Services. Don’t wait to download the app until GA, do it now and play with it so you’re oriented to this tool and ready to go come General Assembly. Plan a check-in breakfast/lunch/dinner with some people you know at some point. Even if you’re the independent/introverted type, GA is really kinda overwhelming in the sheer mass of people and having a drink with some familiar faces can be really nice. If you are the only one you know going to GA, start making friends with people in the UU Growth Lab at GA Facebook group and via the GA app. Prepare your elevator speech about what Unitarian Universalism is and why you are one. Folks ask questions; be prepared to answer. You do still need to eat. You’ll need to schedule that in. Whatever you do, go to the Service of the Living Tradition on Friday night (updated) & the Sunday morning service. If you are in need of emotional or spiritual assistance, if you experience any kind of harassment, grab any shirted GA volunteer and ask them to help you be connected with either the Right Relations Team or the chaplains. You need to register to sing in the choir. Plan to be there for registration as soon as possible, every year it is different but it does fill up. This year (2014) it says “GA Choir registration will be held Tuesday 2:00pm– 6:00 pm and Wednesday 12:00 pm – 2:45pm at the kiosk in the West Prefunction lobby on the fifth floor of the Rhode Island Convention Center. Singers may register and pick up their music (for a $10 music fee). There will be a waiting list kept at the first rehearsal for spaces that may open subsequently.” Note all the rehearsals in the schedule. You may miss something else you’d like to do. You can’t do it all. Choir is a commitment, but worth it. I’ve heard the same about being a volunteer. Before GA, make time to play — with the mobile app! If you’re going to the UUA’s 2014 General Assembly conference in Providence, RI this June and have a smart phone or tablet, you’ll want to make sure to download the brand new UUA General Assembly app. I just gave it a test drive and it is fabulous. But don’t wait until GA, you’ll want to downloaded it now and start using it so come General Assembly, you’re good to go! Before GA, make time to PLAY! The UUA General Assembly 2014 app is LOADED with features. So many, in fact, that I think you need to spend some time with the app before arriving at General Assembly. You don’t want to waste valuable GA time getting oriented to the app — do that in advance. View schedules, explore sessions, and find after parties. Create your own personal schedule and access location and speaker information. Access interactive maps and find local places. Check­in to sessions, meetings, keynotes, and exhibitor booths. View an entire feed of the event activity, including attendee check­ins, photos, and more. Earn points, badges, and prizes for being active on the app and at the event. Expand your professional network and have fun! See? It’s loaded… So, do take time to set up a profile, figure out how to navigate to events and venues, share photos, and follow people you want to connect with at GA before you arrive at GA.
Make sure that if you use the app, you still Tweet and share Facebook and other social media updates. The app lets you connect Twitter, Facebook and LinkedIn accounts to the app and select which updates get sent out via those channels. Don’t forget to include the #UUAGA tag in any update you post via the app that you are also sending to Twitter! The app does not hashtag for you. While this app allows us to connect with others at GA in powerful ways, much the way Twitter & Facebook connect us year round, we need to make sure we don’t totally abandon those who are not plugged in! Keep your heart open and your eyes out for those who are not digitally connected at General Assembly. The app does let you take and share photos. However, if you take and share photos of public witness and and use the app to send them to Twitter, they appear as links in your tweets, not automatically displayed Twitter photos. During public witness I’m going close the app and focus on sharing Twitter photos and videos made with Vine — that will get more reach. You can connect with me, Peter Bowden, on the GA app and on Facebook & Twitter. During General Assembly, this year I will be focusing on talking ministry & media with all of you. Also, look for my Leading Congregations ad in the GA program book. That’s the home for my interfaith congregational consulting practice . At General Assembly I’m going to be booking the rest of my speaking, training and coaching for the year. If you wanted to work with me in 2014-2015, make sure to connect with me at GA. I expect to be booked for year by July 15h. Reprinted from previous UU Planet post. You have a smart phone, you’re on Facebook, you might even have an iPad. If you DO and you’re at General Assembly, it is time to try Twitter. I know you can do it and I want to follow your tweets. Here’s a quick guide. Find someone you know who is techie and probably tweets. Offer to buy them an ice coffee if they help you get set up on Twitter. I’m serious! GA is the perfect time to get some social media and tech coaching from friends and colleagues. We need to help each other to learn the communication tools of our time. I’ve found that one-on-one is best for some people, especially those who are anxious about trying. That’s why I’m doing more private clergy social media training these days. But I can’t do that for everyone. We need to help each other. If you are at GA and Tweet, try and teach one person how to do the same during the week. Write your first tweet. If you’re at GA, include the hashtag #UUAGA. Next, have them show you how to search for a hashtag, that’s the keyword tags we use to create conversations. Search for #UUAGA by clicking here. Follow other UU’s tweeting using that tag. Follow me on Twitter @uuplanet. I’ll follow you back. Let me know via Twitter if you’ve started Tweeting this GA.
Don’t forget to use the GA Hash Tag! When you tweet during GA, if you want all of us to follow it, include the tag #UUAGA. On Saturday, June 23, 2012 thousands of Unitarian Universalists and immigration partners protested outside of Sheriff Joe Arpaio’s Tent City jail. The following are videos containing footage from this event, including UU World videos and media from vigil participants. For full coverage of this religious witness event and the 2012 General Assembly of the Unitarian Universalist Association, visit the UU World’s GA blog. Our colleagues with Denver Film & Video recorded the speakers at the vigil — 14 minutes. UU World description: The Rev. Leslie Takahashi-Morris was part of a delegation of religious leaders who toured the ‘Tent City’ jails in Phoenix, Ariz., on Saturday June 23, 2012. Black, Jaramillo, and the Rev. Karen Georgia Thompson, UCC Ecumenical and Interfaith Officer, attended the UUA General Assembly as interfaith guests. Black took part in the Sunday worship service. Three days before the Tent City vigil, the Unitarian Universalists Association held a rally following the opening of their 2012 General Assembly conference. Event was held on the block adjacent to the Phoenix Convention Center. Read the UU World blog post about this event. This week I will be video reporting on the 2012 General Assembly conference of the Unitarian Universalist Association (UUA) for the UU World Magazine. Coverage will be posted on the UU World’s GA Blog, including videos, and be shared via all available social media channels. Connect with the UU World and follow this week via links below. Follow me on Twitter @uuplanet. UU’s I know are welcome to friend me on Facebook. Need to reach me at GA? Message me via the above channels or leave voicemail at (617) 744-9784. This will forward to my cell and notify me via email.